Early season fishing sees fantastic results ! If the first 3 weeks of the season are anything to go by; then season 2016 / 17 may go down as one of the very best yet. The wild browns caught have mostly been in very good condition, having lived through a reasonably benign winter. Melbournian Jason stayed at the lodge and fished with us for his second time in mid October. Now Jason is an experienced fly fisher, having fished in New Zealand many times, however he experienced, and I quote “ The best three days fishing he’s every had”. In his 3 days being guided by Aaron, Jason landed 26 wild New Zealand brown trout. All the brown’s Jason landed were over 4 lb, with 80% being between 5 and a very impressive 9 lb. This included several 7 lb browns, a couple 8 lb browns and a 9 lb on his last day ! 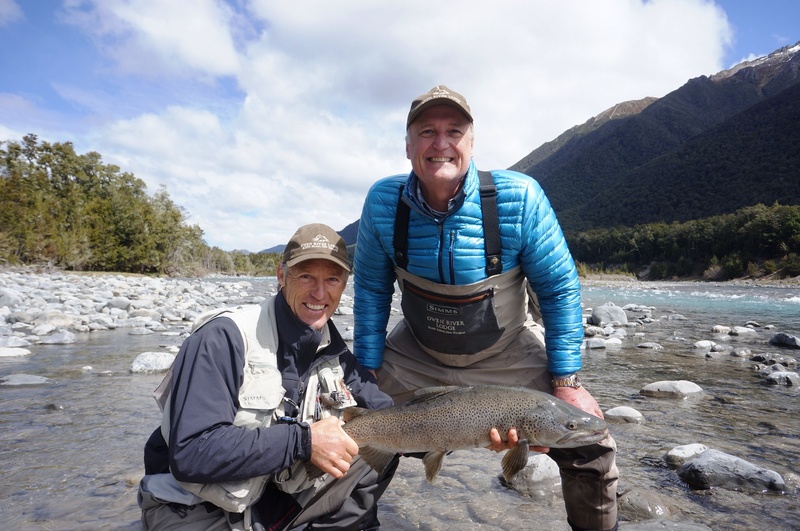 Over 30% of these were taken on drys, which were a mixture of mayflies, cadis and blowflies.Jason certainly experienced some amazing fly fishing in his 3 days fishing in the Murchison region of the South Island. Texan’s, Doug & Carol, stayed with us last week. In their 2 days of guided fishing they landed 7 wild browns including a stunning 10lb brown on a wee parachute adams ! The early season fishing has not disappointed and we still have good availability during the season, so contact us today !